Master Assassins by Robert V.S. Reddick. Talos, 2018. Hardcover. Buckle up and grab some snacks, folks, because this is going to be a long review for a book that has quickly become one of my newest fantasy favorites. 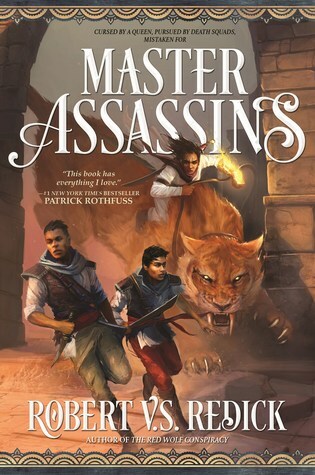 Master Assassins is beautiful, dark, raw, jaw-dropping at times, and all-around amazing. Because I run the risk of rambling in a disorganized fashion, I decided that I would organize my review into four main components of the novel that I want to talk about: characters, writing style, setting, and plot. Also, I will be going into depth about what I liked about this book, but I won't go into too much detail regarding any specific characters, plot points, places, etc., simply because I think this book is so enjoyable to go into not really knowing what to expect. Characters. This is, hands down, one of the best casts of characters in a fantasy series that I've read in a while. I had pretty mixed feelings about each character when they were first introduced, but by the middle of the novel I discovered that I had developed extremely strong feelings to each one and felt incredibly connected to them, more so than I have in quite some time. Kandri and Mektu are brothers and are our two main protagonists. The two could not be more different, but it becomes apparent that at the end of the day they are still brothers and are still there for one another no matter the consequence. Their entire relationship was so authentic and relatable and really brought life to the story. Kandri is the ever-patient, practical man who has no time for rule-breaking and nonsense, whereas Mektu is this completely unpredictable, semi-mad figure who is always opening his mouth when he shouldn't and getting everyone into trouble. I hated Mektu at times, but I also loved him just as much. I loved both of these brothers, let's be honest. Mektu is the kind of the character that is endearing because he is such an enigma and you can't figure him out, whether he is mad or brilliant or a bit of both (likely the latter), and he was just such a joy to read. The dynamic between him and the other characters is enough in itself to make this book enjoyable. The other main figures are Chindilan, a sort of uncle to the brothers; Eshett, a victim of human trafficking attempting to find her way home, Talupeke, a warrior who also joins them, and Ariquina, a woman of interest from Mektu and Kandri's past. I worried at first that the female characters would be portrayed in the stereotypical manner of high fantasy novel, usually used as some sort of prop to move the plot forward with little redeeming qualities, the women in this book were none of those things! Each woman brought so much to this story and played such a vital role in a myriad of ways. I was really pleasantly surprised and impressed with how Redick wrote these characters, and I applaud his work. It is always nice to read some well-written female characters in a genre where they aren't always often portrayed so well. I'd love to go into more detail about each one, but this review is already going to be far too long, so I'm holding back for now. Chindilan is a father-figure that I loved. He's blunt, (hard-nosed), and --, but he's also unfailingly loyal and an invaluable person. Writing Style. Many people seem to be describing this as 'literary fantasy,' and I'm pretty much inclined to agree with that statement. Redick's style is, first and foremost, stunning and clearly thoughtfully done. The cover and title of this book does not really match what I expected from the book, but now that I've finished the book there is a certain appeal to them. I actually like how both the title and cover give a somewhat different impression from what this book is, and I think it adds something to the overall brilliance of this book and not being able to really predict anyone's actions. The narrative has such a strong voice, incredibly mature and meaningful, but also not over the top. It has a certain flow to it that was incredibly compelling and told the story in the most engaging way possible by really pulling the reader into the events and feelings of the characters. I'm partially inclined to describe the style as a raw, almost brutal tone at times, but that doesn't feel quite right because it is also eloquent and affecting. There is a softness intermixed with more jarring aspects, and I think that is part of what makes this book such a masterpiece. Also, there is an abundance of humor that is both obvious and not so obvious, which I appreciated to no end. I was truly never bored with this book, and that isn't always the case. On a more technical note, Master Assassins is written in present tense with a semi-parallel narrative that splits between the current happenings of our characters and flashbacks of these characters' lives while growing up. Prominent and frequent flashbacks are always hit or miss with me, but in this case they were an absolute hit. The flashbacks added so much depth and intrigue to these characters and what was currently happening, and I loved delving deeper into the backstory of the characters' lives. Setting. The world-building is fantastic. It's incredibly detailed and realized, but it's not so complex that you become lost or can't figure out what is happening--it's approachable. I haven't seen anything about what might've inspired the world of Urrath, but I would be fascinated to hear what did help to mold this world that is both desolate and also full of so much life and culture. In addition to the physical world, Redick has also created a fascinating religious component, one that was both mysterious and intimidating, yet also incredibly intriguing. There is this sort dark, tragic element to the religion that made it feel more like something akin to compulsion than anything else. I could read too much into things, but all I have to say is that I was completely hooked by this aspect. Plot. This book had one of the best plots I've read in a long time, and that is befcause it was completely unpredictable from start to finish. I had only a vague notion of what this book was about going into it--which is my preferred manner of reading, usually--but this time I really didn't expect anything in particular or know much about it other than the fact that Mark Lawrence and Patrick Rothfuss both highly recommended it. I cannot say how much I loved the unpredictability and it's honestly one of the things that made this book so exciting to read. This story starts off with two brothers living as soldiers who don't really have any grand plans to do anything other than that, and by the end of the book the beginning almost feels unrecognizable. There's nothing really stereotypical because it just felt so different from other books I've read and this made the adventure that much more enjoyable. There is so much mystery around everything that happens and everything people say--I just couldn't get enough of it. Another thing that I loved was how Redick managed to interweave so many different threads of both major plot elements and minor details into something so epic and fluid. If I tried to recount what happened in this book, it would end up sounding so jumbled up and perplexing that you would think I'm crazy (which, let's be honest, that's still questionable) and this book is confusing. But it's not! This book does require careful reading to pick up all the subtext, but the book itself is just so masterfully written that it feels effortless (though I'm sure Redick put a lot of hard work and effort into writing it!). The last point I want to touch on that is really more theme-oriented than plot-oriented is that of war. There are constant undertones regarding war in this book, and not just one army vs. another army types of war. War within yourself, between yourself and others, between yourself and the elements--it's endless. What I liked about this theme was that it felt as if at times this idea of war was treated with the general serious sentiments people usually have towards war, but there was also a weariness and tiresome quality attributed to it, a less-serious look that brought a lot of interesting thought to the matter. 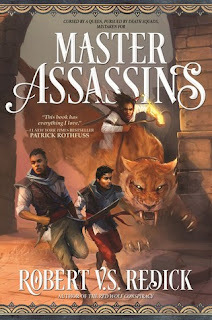 Overall, I've given Master Assassins five stars (surprise, bet you didn't see that one coming!). I also would like to thank Mark Lawrence once again for turning me onto such a fantastic book. If there is one thing I've learned, it is that I should always take Lawrence's advise when it comes to books because so far I've read three books that he's raved about, and we are at 3/3 brilliant. If you are a fantasy fan or simply a fan of great writing and storytelling, then go pick up this book! **Added note: The author shared with me a wonderful post he made on his website about his feminist intentions in this book, which I found a very interesting and important read and would encourage others to read it as well. I didn't see this post until after I finished the book and my review, so it was a great discussion to tack on. It can be found here. *This is currently available in both hardcover and paperback. **No, I am not being sponsored to write any of this, I just like to provide information and encourage people to read awesome books.